A Disturbance in Maybole, 1831. "By Jasus pull her down"
Direct action, it seems, is always with us. Genetically modified crops, new roads, the export of live beasts for slaughter, airport extensions, fox-hunting, the price of sheep: in recent times these and other issues have prompted people to attempt, by means of disruption and force of numbers, to succeed where legitimate avenues, if used at all, have failed. This article concerns an example of direct action in Ayrshire in the last century. The focus of the agitation was the potato, that humble root vegetable whose introduction to Europe changed the face of society. On 17th November 1831 the editor of the Air Advertiser shared with his readers his concern at the lawlessness which was evident in all parts of the country. There were riots and disturbances at Bristol, Preston, Coventry and other places. The occasion of the recent riot in Coventry was a reduction in wages, in response to which "the mob rose and destroyed the looms in a steam power factory, and afterwards reduced to ashes the building itself". At the general election in May 1831 there had been riots in Ayr and elsewhere in Scotland. "Anarchy and confusion" could only be averted, argued the editor, by "speedily and effectually, carrying into a law the Reform Bill", with or without the support of the Lords. No less serious than the violence in Coventry, in proportion to the size of the town, was the action taken by the weavers in Maybole against the enterprise recently commenced by James Underwood (age 50). Underwood had for some time been producing potato flour in Girvan. In September 1831 he moved his operation to Maybole, contracting with James Hepburn (45) at Deans mill for the use of the "lower flat" of the mill and for power from his water wheel. Hepburn operated his woollen mill on the "upper flat". According to the report in the Air Advertiser on 17th November 1831, the object of the transfer was to carry on the business more extensively. However one of the rioters, John Baird, was later quoted by special constable Andrew Baird [no relation] as having said: "they had put the miller away from Girvan, and would be damned but they would put him away from Maybole unless he gave up working". Underwood set up his grinding and sieving machinery in Hepburn's mill, and began his operation in the first week of November. Within a few days Hepburn heard of some agitation in Maybole, and asked him to quit. Underwood said that the people of Maybole had not complained to him, but that "Hepburn had told him that some old women had determined to destroy the mill" and he did not take this seriously. But it was not simply a matter of old women. The attack on Deans mill was agreed in Maybole on the evening of Saturday 12th November. The next day being Sunday, the action was planned for Monday 14th; the perpetrators were prepared to destroy machinery but not on the Sabbath. Back to top. Map showing Maybole and Deans mill. That Monday a large crowd gathered in the Kirklands of Maybole. 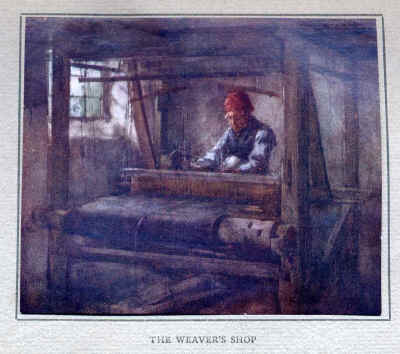 Many of those present were weavers: of the 12 subsequently charged, 10 were weavers and one the son of a manufacturer residing in Weaver Vennal in Maybole. The gathering came to the attention of Walter Andrews (36), a writer (solicitor) in Maybole and procurator fiscal for the burgh. Since the Kirklands was outwith the jurisdiction of the burgh, he gave notice to the Justice of Peace Fiscal. Then Andrews, in the company of Andrew Baird (52), a merchant in Maybole and a special constable, and a Mr Brown not otherwise mentioned in accounts of the incident, went to observe the proceedings. The crowd surrounded Andrews, and a man whom he later learnt was John Baird acknowledged that the purpose of the meeting was to destroy the potato machinery at Deans mill. Andrews remonstrated with them, pointing out that the action they intended was both unlawful and dangerous, but Baird "damned himself" that they would do it. Another young man said that they might send out constables, but "they would do for them". One might say that feelings were running high. They proceeded to their work before constables could be raised. Many were armed with sticks and similar weapons, and some were carrying an effigy of a man, which was thrown into the mill stream at the end of the affair. However one of their number had sought something worse. Alexander Gibson (14) had earlier that morning called on Gilbert McCrindle at his farm of Thornbrock, situated on Piper's Hill above the mill. Gibson had asked to borrow a pistol, ostensibly for sport; McCrindle told him that he had only his cavalry pistol and it was not for shooting at "birds or game". McCrindle later thought that Gibson had mentioned that the machinery of the potato mill was to be wrecked that day. Thomas Aird (21) was at his usual employment, breaking stones in the street near Well Trees toll when, at about 1 o'clock, he saw the crowd. They did not carry on down the new road past the toll, but turned off by Allan's Hill on the old road leading to the mill. He followed but did not cross the mill burn. It was the evidence given by Aird, and by others who like him had observed from a safe distance, that formed the case against those accused. Back to top. Although, or perhaps because, the attack was expected, Andrew Hepburn was not at his mill or his nearby house, but was on business in Maybole. His son John (15), who said there had been a previous report about what was to be done, was there; also his daughter Janet, James Underwood and Underwood's employee, Helen Beaumont (45). And so they arrived at Deans mill, crossing the burn by the wooden bridge. Some immediately surrounded James Underwood, who came out to meet them. Others entered the building. They told Underwood to stop his mill, which he did. They claimed that he was grinding from 8 to 10 bolls of potatoes every day, that he was paying 8s.6d. per boll, and that in consequence the price of potatoes in Maybole had risen one half penny a peck. In response Underwood said that he ground only one or two bolls a day, and that "instead of raising the market" he would sell them potatoes at 6s. a boll.1 One of the men agreed that they would desist "until the matter was investigated". But it was too late. While some made a ring around Underwood and told him their grievance, others had entered the mill and were already carrying out his machinery, which they proceed to break with sticks. Some of the crowd went and fetched Janet Hepburn from the house, to point out what belonged to her father, so that it could be spared. She saw them take a cylinder and two wheels of Underwood's outside and smash them to pieces with sticks and stones. They asked her for an axe, but she refused. Iron was carried off and some machinery was dumped in the burn. Back to top. Rankine Kennedy (20) named those he saw at the centre of the action, including William Milligan, Thomas Aird, Charles Fisher, John Craig and John Baird. He heard Underwood offer to sell potatoes at 6s. a boll and flour at 1d. a pound, but after that he heard someone shout "By Jasus pull her down" (many of the weavers were Irish). Then he saw a large grater brought out and a crowd smash it with sticks. Later Andrew Hepburn, returning from his business in Maybole, met a large crowd coming from his mill, but he could not identify anyone. However his daughter Janet and son John both gave evidence against some of the mob. Back to top. Twelve men were charged with being part of the mob which had advanced upon Deans mill in a "riotous and tumultuous manner, to the terror and alarm of the lieges, and the disturbance of the public peace" and which did "in a violent, and illegal, and tumultuous manner, and upon the unlawful pretence that the business so carried on by James Underwood had a tendency to raise the price of potatoes, break in pieces and destroy the machinery" and associated acts. Five were also charged with absconding. Thomas Aird labourer, Charles Fisher (22), James Neill (c.20) and John Craig (18) weavers, and Alexander Gibson, son of Mathew Gibson manufacturer, were incarcerated in the jail in Ayr on Monday 21st November. Gibson was released on 22nd November "having found caution". Thomas Griffin (12/13) joined those in jail on 5th December, William Muir (37) weaver on the 7th and John McCulloch (34) weaver on the 8th. The men who had absconded immediately after the incident were John Baird, James Smith, William Milligan, and John Morrison weavers, and Thomas Smith, occupation not recorded. No record has been found of their subsequent arrest and trial, at least in the period to 1840. Witnesses were interviewed twice, because the Crown Counsel was dissatisfied with the first precognitions. He sent a note to Alexander Murdoch, the Procurator Fiscal at the County Buildings in Ayr, setting out his complaints. At the suggestion of Crown Counsel Thomas Aird, whom Murdoch had intended to charge, was pressed to become a witness against the others. Counsel desired more evidence to make out a case against Smith (though whether James or Thomas he did not say) and Milligan, who were identified as the bearers of the effigy, and against Baird, Griffin and Morrison, who were among the worst of the rioters. Back to top. At some point the six men in custody were transferred to the tollbooth in Edinburgh, but they were returned to Ayr on 18th February 1832, and were brought to trial at the Circuit Court there on 6th April. All pleaded guilty to mobbing and rioting, and a further charge of malicious damage was dropped. They were sentenced to 4 months imprisonment in Ayr, after which they were to be bound over for two years on surety of £10. Alexander Gibson, who was tried on the same day and who also pleaded guilty to the same charges, was sentenced to 6 months imprisonment (because he had been at liberty while the others had been in jail awaiting trial) and was bound over in the same terms. Back to top. "Lord Meadowbank said that mobbing and rioting was a crime of a most heinous nature, and must be repressed. Public property could have no security whatever if crimes of this description were to go unchecked and unpunished. The lower order seemed to be blindly prejudiced against this branch of manufacture. In place of lowering the price of the article, as they falsely supposed, such depredations, by destroying this most necessary article of food, raised the price of other produce, and prevented those concerned in such manufactures from giving employment to the industrious poor. Potatoes were a species of food which, unless converted into another form, could not be preserved for any period. This was a striking instance of the headstrong ignorance of the lower orders as to the consequences of their unlawful outrages. It only required to be pointed out, in order that any man of common intellect might see at once, that, by stopping the manufacture of any article of food, they raised the price of other commodities, and, this, brought misery on themselves and their neighbours. It is grievous to think that people will be so infatuated. This, however, is only one view of the case. Another and a not less important view is the eagerness with which this disposition for rioting spreads, and the vile contagion with which the ring-leaders infect others who are weak or ignorant enough to support them. The person who joins a mob which commits an outrage, although he uses no violence himself, is nevertheless as guilty of mobbing and rioting, in the eyes of the law, as if he had taken an actual part in its illegal proceedings. How often does it happen that the instigator of a mob escapes, while some ill-advised individual, who, perhaps, never lifted his arm to commit violence, is punished for the crime! The law on this point reads a strong lesson to individuals, generally, to beware of listening to the advice of those, who, older in crime than themselves, would wish their aid in infringing upon the laws of their country. Were such meetings and riotings to be allowed to go unpunished, it is impossible to say where the violence would stop. When a riot is raised, and evil-disposed minds come in contact, the whole mass becomes corrupt - and resist the authority of the magistracy and the laws of the country - and pillage and murder are the too-frequent consequences. There were three things by which he would be swayed in the present instance. First, that one of the charges had been withdrawn, secondly, the certificates of good character, third, the term already served." Back to top. Meanwhile James Underwood, who had seen his machinery and his livelihood destroyed, had taken an action before the sheriff against the "Clerk of Supply for behoof of the County", for the losses he had sustained. The sheriff found that the county was liable in full, and that these together with the expenses amounted to £42.6s.4d. The commissioners were entitled to levy an assessment for this sum on all lands in the county, according to valued rent. However, taking into account the expense of making such a levy, and regarding the sum as "not very large", the commissioners decided on 30th April 1832 to pay Underwood out of the rogue money. Illustration in "Reminiscences of Scottish Life and Character" (1911) by Dean Ramsay. From a painting by Henry W. Kerr RSA, RSW. Underwood's damages were equivalent to about £4,000 today. An interesting comparison may be made with the annual income of a handloom weaver. Following a long period of decline, by the 1830s, handloom weavers such as those in Maybole were living in destitution. According to Smout, "[t]here were plenty struggling on family incomes of five shillings a week in the 1830s who in 1815 would have earned a full £1 for the same work". £42.6s.4d. amounted to three or four times the annual income of handloom weavers' families. The mobbing and rioting sprang from the desperation of men who, rightly or wrongly, believed that the potato mill was raising the price of the commodity which alone stood between their families and starvation. Back to top. 'Deans Mill' still appears on OS maps, though I think none of the 1831 buildings remain; the topography has of course been much changed by the advent of the railway. And what became of them, the seven convicted and the five who absconded? Well, the census returns for 1841, 1851 and so on are available on microfilm in the Carnegie Library: there is a starting point. This article was published in Ayrshire Notes No.17 (Autumn 1999). In Scots dry measure, 16 pecks equal 1 boll. For wheat, peas, beans, meal etc, 1 Scots peck was appoximately equal to 1 Imperial peck (2 Imperial gallons), and 1 boll was approximately equal to 4 bushels. For barley, oats and malt, 1 Scots peck was approximately equal to 1.5 Imperial pecks (3 Imperial gallons), and 1 boll was approximately equal to 6 bushels. There were local variations. [The Concise Scots Dictionary, ed. Mairi Robinson (1987 edn.)]. Back to text. 1. AD14/32/317; indictment, precognitions, correspondence. National Archives of Scotland (West Register House). 2. Ayr Advertiser 17/11/1831, 24/11/1831, 12/4/1832. Carnegie Library, Ayr. 3. CO3/1/9; minute book of the Ayrshire Commissioners of Supply (p112, 30/4/1832). Ayrshire Archives. 4. B6/15/19-20; Ayr Burgh Register of Incarcerations, Arrestments and Loosings Thereof, 1830-1840. Carnegie Library, Ayr. 5. New Statistical Account of Scotland, Vol.V pp.348-380, Rev. George Gray, Maybole, September 1837. 6. T C Smout, A History of the Scottish People, 1560-1830 (1969). 7. Note the recently published: Larry Zuckerman, The Potato (Macmillan 1999).